l was camping last weekend with five other fathers and a total of nine children between the ages of four and eight. At night we would drink, play cards, and listen to music from a bluetooth speaker connected to an iPhone, because this is the twenty-first century, and that’s what you do now. Since nobody wanted to listen to more Bob Dylan (seriously, none of these guys – all friends of mine – even read this blog! One didn’t even know I was writing it! ), we settled on Willie Nelson. When you are camping with a bunch of guys, everyone is in favour of Willie. The relationship of Dylan and Willie Nelson goes back a long way, and is clearly a close one. Nelson started Farm Aid because of an inappropriate Dylan quip, and he played at the Thirtieth Anniversary Concert Celebration. A few months later Dylan returned the favour, playing at Nelson’s sixtieth birthday party celebration. You can watch the entire show online (Waylon Jennings! Kris Kristofferson! Ray Charles! BB King! Bonnie Raitt! Lyle Lovett! Paul Simon! – seriously, it’s good! ), or you can skip right to the two Dylan songs. Here (skip ahead to 5:25) he and Nelson do a pretty good version of “Pancho and Lefty”. Here (starts right at the beginning) Dylan does a version of “Hard Times Come No More” by himself. Also pretty good. 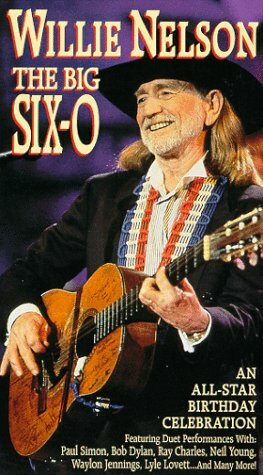 I have a lot of Willie Nelson on my phone, more than enough for a camping trip. I was surprised, though, to learn that his first album, And Then I Wrote, came out in 1962, the same year as Dylan’s debut. I was not as surprised to learn that he has recorded more than sixty studio albums – an incredible number. Nelson is almost as much a legend as Dylan – more, in certain circles – but even though he has a huge body of work (thirty films in addition to all those albums), I don’t think I could write about him for a year. Nelson has a totally different kind of celebrity, one that is built around his incredible consistency. Listening to Nelson sing at his sixtieth birthday doesn’t sound that much different than he did at forty. He is smooth and professional, but he’s not the change agent that Dylan is. Dylan has higher highs than Nelson (not trying to pun off Willie’s famous taste for marijuana) but also lower lows. Nelson may have created the genre of “outlaw country” with Waylon Jennings, but he never re-invented himself the way that Dylan consistently. It’s hard to imagine Nelson confounding his audience in the same way. That’s both a good thing and a bad thing. The other night I was talking about Nelson at the birthday party of a friend (also not a reader of this blog!) and my friend Derek (who is a reader, thankfully) asked me if I was going to write about Red Headed Stranger. I had to admit that I didn’t know that album at all, and then Derek got excited and then he got me excited about the first ever country music concept album (“Better than The Wall!”, he exclaimed). That was an interesting moment, because it recast Nelson a bit in my mind’s eye. I had an image of him as someone who didn’t aspire to the sorts of things that Dylan attempted, and so I was pleased to learn about this album. I’m happy to have my assumptions proven wrong, when it’s for the better. I read a great line from Dylan in the past couple of weeks about Nelson, but for the life of me I can’t find it now. In response to critics who said one of his recent albums was a disappointment (probably Under the Red Sky) Dylan wondered why no one gave Willie Nelson crap for putting out a disappointing album. He noted that Nelson put out two or three albums a year (in 1994 he put out three, for example) and no one expected them to redefine the art form every time. Why, Dylan moaned, couldn’t people just let him be like Willie Nelson? That, of course, is the key to the difference between the two men. One final note: The last time Dylan performed in Calgary, Rebecca and I went to see him. One of the reasons that we went was the Willie Nelson was the opening act. Unfortunately, Nelson didn’t play the Canadian dates, and there was no opening act. That was a greater disappointment than the relatively poor Dylan set. Maybe I should do a Nelson blog next year, though it is an awful lot of made-for-tv westerns…. PS. Despite having played 66 concerts in Texas, Dylan has never played Luckenbach.